Well first year queers (gayby’s? queerby’s? q-frosh? We should work on thinking of a cute name for queer first years) first and foremost, I am absolutely delighted to welcome you to the Duke family. You’re in for four years of excitement, confusion, frustration, anticipation, fabulosity, learning, and fun. As a senior, former President of Blue Devils United, and current Vice President of Equity and Outreach for Duke Student Government, I’ve been around the block a few times, so I wanted to provide you with some quick advice on how to survive at Duke as a member of the queer community. Here are a few tips. 1. Know that there is no such thing as “the Duke Queer Experience”: Our community is vast at Duke, and everyone experiences this place differently. For many people, particularly gender conforming gay white men (although this category itself can be problematic and rife with discrepancies), Duke can be pretty great. There are tons of queer people at Duke who feel completely welcome here from the day that they set foot on campus and never experience any form of marginalization. If that’s your experience, that’s fantastic! Just try to keep in mind that many queer people at Duke still feel very marginalized, alone, isolated, etc. There is no way to define “what it means to be queer” at Duke. Trust me, I’ve tried. 2. Know that you’re welcome everywhere, even though it won’t always feel like it: In your first few weeks of school the heterosexuality of campus can be absolutely overwhelming. I remember my first Duke party during orientation week. People were totally cool with the fact that I was gay, but I still felt pretty alone because heterosexuality was blantantly and unapologetically the norm. This is not true of all parties at Duke by any stretch (#roundtable #brownstone #nexus #ubuntu #pegram #coffeehouse #you’llunderstandthesehashtagswithinthreeweeksIpromise), but it is of a significant portion of them. When you encounter those spaces, it may feel lonely at first, but there are always other queer people there. I promise. 3. Know that Duke can be terrible: While Duke has made great progress towards being a queerer campus in the past few years, it’s not perfect. As a queer person, you may have some awful experiences here. When I was a first year, I hung my rainbow flag out of my window in my dorm and proceeded to have it torn down on three different occasions. Because Duke can be terrible, don’t be shy about reaching out to others when you need support. The Center for Sexuality and Gender Diversity can be a great resource, CAPS is vital, and a good group of friends helps too. 4. Know that the queer community, like any community, isn’t perfect: At Duke, not all queer people get along. Not all queer people even identify as queer. As a gender non-conforming person, there are some people even within the queer community who don’t like the way that I dress. There’s drama that can fracture things, especially on a small campus. There can be rifts between activists and non-activists. We have a robust and healthy community here, but it has its flaws. 5. Don’t hold too strongly to identities: You are queer, and that is great, but please don’t think that’s all that you have to be. You are never reducible entirely to your queer identity, no matter how important it is to you. 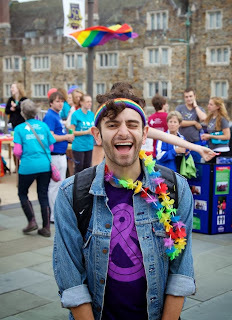 Branch out beyond just those in the queer community, because straight allies are plentiful and incredible at Duke. 6. For the love of God, be an activist: Note here that I didn’t say be a queer activist (although you should consider it). As a queer person, you don’t have to do all of your work around queer issues, but please please please be engaged in social justice issues during your time on campus. After all, the white-supremacapialist-heteropatriarchy won’t overthrow itself. 7. Know that you’re indebted to people you don’t even know: Duke hasn’t always been a great place for queer people (be on the lookout later for more activism about queer history on campus! ), and it has only changed as a campus because of people who came generations of students before you. The first queer group on campus started in 1971, and since then, hundreds of people have worked to make Duke the school that it is for queer people today. Never forget how much you owe them, and never take your community for granted. 8. Lastly, keep your head up, no matter what anyone says. I can’t tell you how excited I am to meet each and every one of you. If you see me walking around campus, please say hello, introduce yourself, and let me know something cool about you. I may only be here for another year, and I might be a little bit busy with my senior thesis, but you should know that the day you set foot on campus, you already have at least one queer friend in me.